We really like these 5-ply Spinfighter paddles from Nimatsu's competition line. The high-quality ITTF-approved smooth inverted rubber with 2.0 sponge provides substantial spin and speed. 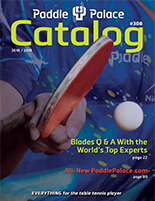 The feel and performance is closer to custom paddles than most other recreational paddles. Handle styles are attractive, professional-looking and feel comfortable to the hand. The Nimatsu Spinfighter is a bit slower with more control than the Scorpion, with an OFF- speed rating. Very pleased with this paddle. It is very light and one can generate a lot of speed through the shot. It is perfect for spins, offensive shots and defensive blocks. Very impressive for what it does for $25. I am a relatively new player to competitive Table Tennis. Ive a couple a decent recreational bats.. Just switched to the Spinfighter II and immediately noticed a difference in loop shots and smashes...lots of speed and control. Shots I would not get... I was making. I love this bat. Good quality blade and rubber. Works well with spins. This is an amazing paddle. The rubber is perfect for spins and loops.Also good for kill shots. Very impressed. They should sell the rubber separate. I use a $150 racket, but I bought the Spinfighter for my nephew so we could play when he comes over. This is the first rec paddle I could ever play with, as usually you cant get any speed or spin from the low-priced paddles. The Spinfighter is surprisingly good. I decided to upgrade to the Spintfighter II, from a recreational paddle that I bought from a local sporting goods store. This was a huge improvement! The paddle added speed to my slams, and more spin to my serves! I would buy this again, and recommend this paddle to anyone looking to upgrade with out spending big bucks. This Nimatsu competition spinfighter 2 paddle is my first competitive paddle. I think is a great paddle when played with a good ball the acceleration is amazing and if you hit the ball right it will do a 90 degree turn on the table. Ive played ping pong for a long time and have used some 90 and 100 dollar paddles that dont preforme like this one. If your a beginner or someone who is a little bit more advanced this is a great paddle for you. Im sure you think that the more expensive something is better...not anymore, the spinfighter 2 kicks takes great paddles and puts them to shame.